The Bruins sit at a respectable 3-2 just five games into the new season, Brad Marchand is tied with Connor McDavid for the league lead in points, rookie defenseman Brandon Carlo has looked at home in the NHL, and David Pastrnak is playing some of the best hockey of his young career. Despite these particular high notes, injury woes and poor play from several key players are holding this team back, causing many to worry very early on this season. The most recent of these injury woes have come at goaltender. Anton Khudobin left Monday morning’s practice early on with an apparent injury that will prevent him from starting Tuesday night’s game against the Minnesota Wild. On Tuesday morning it came to light that Khudobin will miss three weeks with an upper body injury. 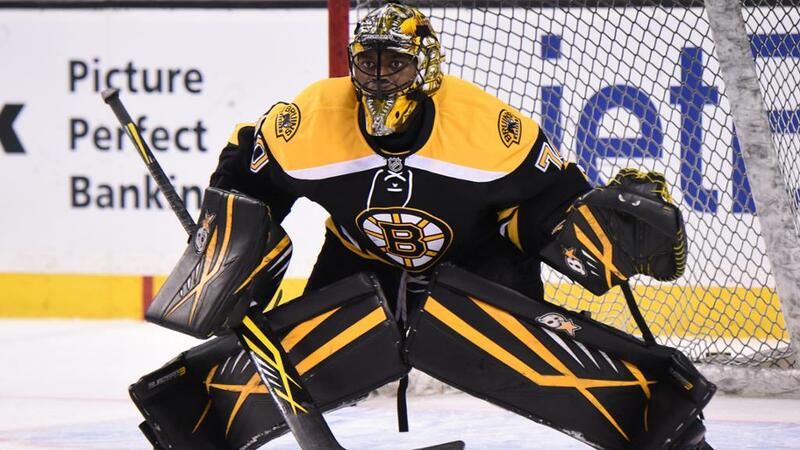 22 year old goalie Malcom Subban will start Tuesday night’s game in Khudobin’s place. Subban has solid stats with the Providence Bruins in his career, but after missing the last months of the 2015-2016 season with a fractured larynx, he is not the best candidate for NHL action so early into the season. His record so far in Providence is 0-3-1 with an .846 save percentage. Though his latest game was his best of the season, it’s worrying that Claude Julien has to turn Subban to play Tuesday night. The talent and skill is there with the 22 year old- he still remains one of Boston’s most valuable prospects- but after a long road back to playing this year, he shouldn’t be thrown to the wolves in the NHL so soon. Unfortunately, the Bruins have no other option. Rask remains day to day, Khudobin is on the shelf for the near future, and Boston’s other prospect goalie, Zane McIntyre, is every bit as unproven as Subban is. Only days ago both were in Providence. Tuesday night they find themselves suiting up for an NHL game together for the first time. The pressure is on for Subban and Boston’s defense tonight against Minnesota. Defense has not been a strong point for the Bruins so far this season- outside of Zdeno Chara and Brandon Carlo, no defenseman has been responsible for great all around play. Torey Krug has yet to look like the 40 point scoring defenseman he is, as it appears he is not completely over an offseason surgery. Adam McQuaid will likely return from injury to play his first game of the season tonight, and perhaps provide some poise to a defense that will sorely need it for a victory tonight. Due to McQuaid’s return, rookie Rob O’Gara was sent back to Providence. Not to be outdone by the sudden disappearance of both of Boston’s regular NHL goalies, forward David Backes is day to day with a “minor issue”, according to Julien, and will not play tonight. This leaves center David Krejci, who has also noticeably unperformed after returning from offseason surgery, with likely linemates Matt Beleskey and Danton Heinen. Krejci has found success with Beleskey in the past, and Heinen is bound to flash his offensive talent at some point, so perhaps it’s tonight that the Krejci line finds its footing. Tonight would be a nice night for someone not named Marchand, Bergeron, or Pastrnak to chip in offensively. Ryan Spooner will return to center the third line tonight after lackluster experiments with him playing Krejci’s left wing, a position he isn’t used to. Center is where Spooner has proven most capable, with 31 of his 49 points last season coming while playing center at five on five. He’ll have to drag along Jimmy Hayes, who is already in Boston fans’ doghouse again, and Dominic Moore, who has shown surprisingly good hands for a veteran grinder, on the third line tonight. With Spooner’s offensive creativity, the third line is bound to have a better night than they have with Riley Nash down the middle the past few games. The Minnesota Wild, Boston’s opponent Tuesday night, are 3-2-1 to begin the season and are tied for second place in the Central division.